Sept. 10, 2015, 10:19 a.m.
By Shan Wang @shansquared Sept. 10, 2015, 10:19 a.m. Surfacing the latest Donald Trump gem from a long, rambling video to share it in a story can be a chore. A new tool from The Times of London called quickQuote, recently open sourced, allows users to upload a video, search for and select words and sentences from an automatically generated transcription of that video, and then embed the chosen quote with the accompanying video excerpt into any article. quickQuote, developed by Pietro Passarelli this past summer during his newsroom developer internship with The Times, will let journalists bypass the arduous process of combing through a long video in search of the most interesting (or bombastic) quotes, and then transcribing each by hand. 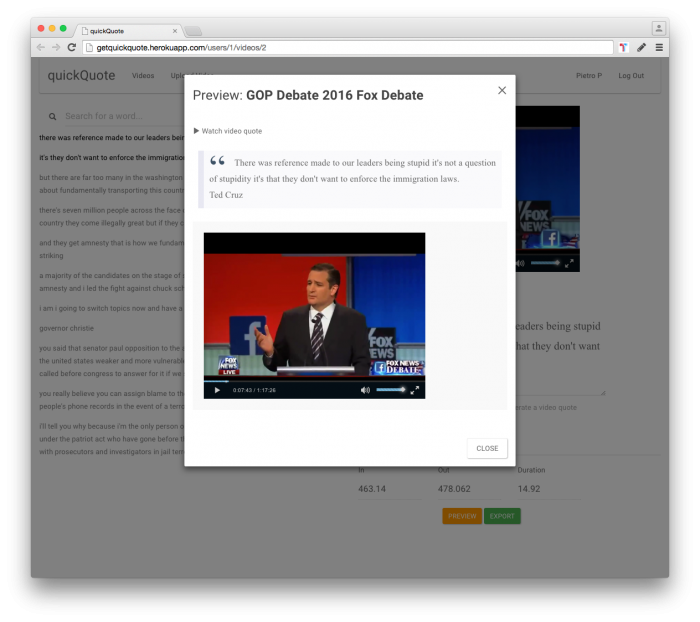 Users can then highlight a quote they want to use, edit the quote on the same page to correct for any errors made by the automated transcription service, and then preview and export an embeddable quote/video clip package. Passarelli says he chose SpokenData, a smaller Czech company, because it produces more accurate transcriptions and was open to making tweaks and adding features (such as the ability to delete a duplicate uploaded video). SpokenData currently only transcribes 15 minutes of audio for free, but other news outlets who download quickQuote can feel free to swap into the transcription component of the code services of their choosing. In a Medium piece about the thinking behind quickQuote, Passarelli pointed out what he saw as a static sameness to how various media outlets recap quote-laden events such as last month’s U.S. Republican presidential debate. The go-to format, he noted, was a pull quote accompanied by a photo of the candidate, but that format captured poorly the more performative elements of the debate. In today’s HTML 5 web, there really should be a better way for presenting these quotes pieces (which after all aren’t rare — see press conferences, book launches, the week in quotes). The quote, in and of itself, often does not tell the full story. So many other elements of nonverbal communication — tone, body language, emotion — are absent in a plain text quote and yet vital to understand the meaning of what is being said. However, it’s not surprising why newsrooms don’t approach quotes pieces in this way. The time it would take to edit individual videos for each of the quotes is considerable and, in a fast paced newsroom looking to publish quickly after the event, simply not possible. During his summer with The Times, Passarelli said, he discussed these challenges with journalists he worked with. The Times, for instance, had experimented with audio quotes in an interactive produced for a piece on the ten-year anniversary of the 7/7 bombings in London. Initially, Passarelli was exploring a tool that would transcribe videos but also offer up other key information about the video, such as the speakers and main talking points. But that idea had too many moving parts to execute efficiently. He also considered a tool that would suggest potentially relevant quotes. But after much discussion, he realized journalists ultimately wanted a tool that would let them search for the words they already had in mind to quote. Down the line, Passarelli said he’d like to incorporate features that allow directly posting a quote and video to Twitter or uploading to external platforms like YouTube. 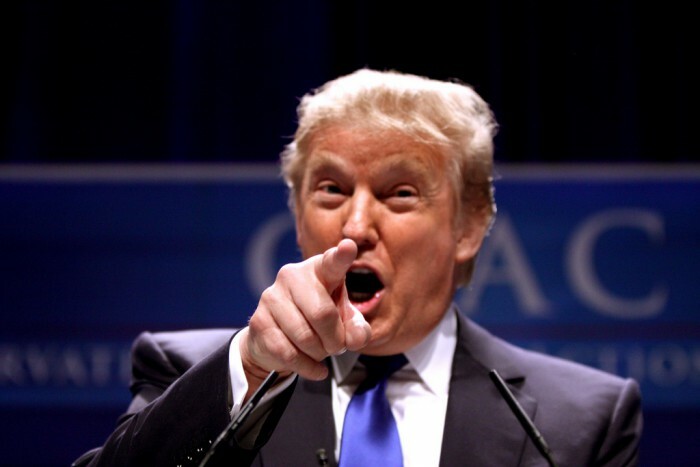 Photo of Donald Trump by Gage Skidmore used under a Creative Commons license. POSTED Sept. 10, 2015, 10:19 a.m.
Wang, Shan. "A new tool from The Times of London lets you easily detect and capture quotes from a video." Nieman Journalism Lab. Nieman Foundation for Journalism at Harvard, 10 Sep. 2015. Web. 20 Apr. 2019. Wang, Shan. 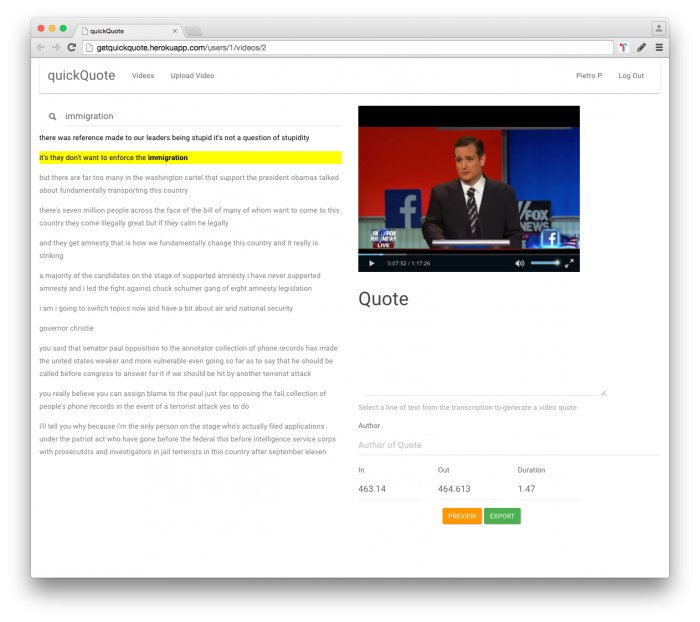 "A new tool from The Times of London lets you easily detect and capture quotes from a video." Nieman Journalism Lab. Last modified September 10, 2015. Accessed April 20, 2019. https://www.niemanlab.org/2015/09/a-new-tool-from-the-times-of-london-lets-you-easily-detect-and-capture-quotes-from-a-video/.